Conrad's English House: Baby News! Wow, Taiga looks so cute! He looks a lot like both of you already. 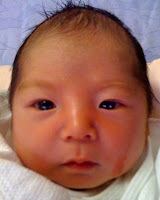 It is usually so hard to get a newborn to open up his eyes, but Taiga looks so alert already! It is nice that Aki gets to stay in the hospital for a week. Here in the U.S. it is usually only 2-3 days and then they send you home. Welcome to your whole new world of parenting! It will be the most wonderful experience in the world, enjoy every moment. Congratulations! Taiga is one handsome boy! We are so happy for you and Aki. Can't wait to meet Taiga and to see him grow and play with his cousins! You two are going to have sooo much fun! Send more pictures Con! He is a beautful baby! Such expressive eyes...he appears curious. I love the amout of thought put into his name. Congratulations! Congratulations to all of you. We are so happy for you. He is adorable!! Keep posting pictures. Wish we could hold him. For now- give him big hugs from all of us. Congratulations!! He was worth the wait! Can't wait to meet Taiga!! Congrats!! Conrad!! I'm so happy to hear that news! Taiga looks so cute and sweet! I'm looking forward to seeing you, Taiga. And Aki-san, "Otsukaresamadeshita!" I can't imagine that long delivery. What a great mom you are! Wow,Taiga-kun is cute!cute!cute!He has big eyes like you and Aki. I can't even imagine how hard 24 hours labor without getting an epidural would be.it was very nice that you could be in the delivery room and support Aki for 24 hours. We can't wait to see baby Taiga-kun!! BTW..I like your Oyaji-gyagu, Conrad :)I remember Ken tried to make me laugh on the way to the hospital, but I'm sorry,it wasn't funny at all when I had contractions every 5 minutes,,hahaha. Please give Aki and Taiga-kun big hugs and "Otsukaresama!" Yeahhhh!!! Congratulations! That is fantastic news! Love the name too. Congratulations from Stockton. You must be the happiest man in Japan! Very interesting story about Taiga's name! I have Japanese-American friends from USC whose parents gave them an "Americanized" first name and a traditional Japanese middle name. Congratulations! Taiga is so cute and looks like Conrad. I think it was so tough for Aki and Conrad to keep patience with the long time delivery. So,if I'll get baby boy, I want to give same name too. More,your wife looks very gentle and beautiful. You look very happy and spend beautiful time. Nawadays,such situation we called "reajyu". Do you understand this mean ? This mean "real busy by happy things". Try use this words if you like. and the meaning of name was great. You are very good father. and he must be "IKEMEN" as like you! Please show me more taiga's photo. Your baby is very cute! He is 11 months old. So I take care of baby too. Taking care of baby is sooooo hard!